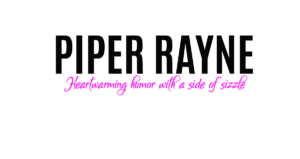 Oh Piper and Rayne….how I love thee!!! Each series of books they write just get better and better!! 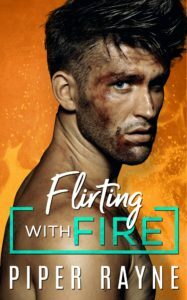 Flirting With Fire is the first book in the Blue Collar Brothers Series and what a helluva way to start!! This is the story of Mauro and Madison. A chance encounter in high school. The nerdy girl and the football star. This is a story that hits you right at the prologue! Madison has carried her insecurities since high school. She has also carried a crush on Mauro since then to. But what was that crush based on? Read this and find out! I so related to Madison’s feelings of insecurity and how her crush started and how it developed into adult feelings of love! Piper and Rayne really know how to pull you into Madison’s mind and the understanding of the difference between puppy love and real love. Oh Mauro…such a alpha hero…swoon, swoon…firefighter, mama’s boy (in a good way), and knows his mistakes and owns up to them. Who could ask for more?? Mauro and Madison’s relationship isn’t without it’s bumps, and there is one character I loved to hate! (You’ll figure it out when you read it!) Their chemistry is so fantabulously hot and steamy, I needed a cool beverage after some parts!! Whew!! And of course I can’t tell you how much I love the secondary characters and cannot wait to read about their stories in future books in the series! Crushing on the Cop and Engaged to the EMT!! Please don’t ever stop writing!! Piper and Rayne you are truly a dynamic duo!! Write on! !